Stem cells have the potential to turn into many different types of cells. Human cells lose this flexibility once they have matured, which is why, for example, heart cells don't spontaneously decide to become lung cells. iPSCs are cells taken from an adult that have been manipulated, or induced, into a stem-cell state. Researchers are then able to guide these "blank slate" cells into different cell types by using various chemical and physical stimuli. Scientists have been able to engineer cardiac tissue using iPS-derived cardiomyocytes (iPS-CMs) for years. However, engineering tissue that can successfully mimic the intricacies of adult human heart cells is not easy and, until now, had not been achieved in the lab. "Human cardiac tissues grown in the lab that displays the behavior of native heart muscle would be transformative for biomedical research," said Gordana Vunjak-Novakovi?, Ph.D., Biomedical Engineering Professor at Columbia University. "To reach this goal, we forced the cultured heart muscle to go through the fetal-to-postnatal transition by an accelerated development. This was done by using early-stage iPS-CMs and increasing the frequency of electrically induced contractions, little by little, every day. The tissues responded, and displayed adult-like gene expression, remarkably organized ultrastructure, and a number of functional features seen in the mature heart muscle, after only four weeks of culture." Vunjak-Novakovi? and her team have made significant strides in reliably engineering human heart muscle that mimics adult myocardium. They found that the longer they waited to introduce physical stimuli such as electric current and mechanical stimulation to the iPSCs, the less responsive the cells were. The team reasoned that the earlier they introduced electromechanical stimuli, the greater the effect would be. 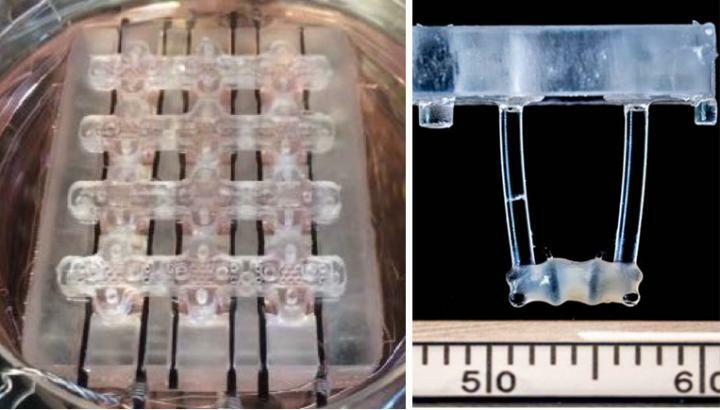 "The resulting engineered tissue is truly unprecedented in its similarity to functioning human tissue," said Seila Selimovic, Ph.D., director of the National Institute of Biomedical Imaging and Bioengineering (NIBIB) Tissue Chips program. "The ability to develop mature cardiac tissue in such a short time is an important step in moving us closer to having reliable human tissue models for drug testing." The better the engineered tissues emulate the human heart, the better they can predict the effects that drugs or environmental factors have on the actual heart tissue of a patient. Having a reliable human tissue model would help make drug development significantly faster, safer and cheaper. The study was funded by National Institute of Biomedical Imaging and Bioengineering, National Center for Advancing Translational Sciences, National Institute of Arthritis and Musculoskeletal and Skin Diseases, National Institute of Dental and Craniofacial Research, National Institute of Environmental Health Sciences, and National Heart, Lung, and Blood Institute through grants EB017103, EB025765, HL076485, and HL138486.